About 350 New York City District Council of Carpenters went on strike July 1, after months of stalled contract negotiations with one of its largest contractor associations, the Manufacturing Woodworkers Association (MWA) of Greater New York. 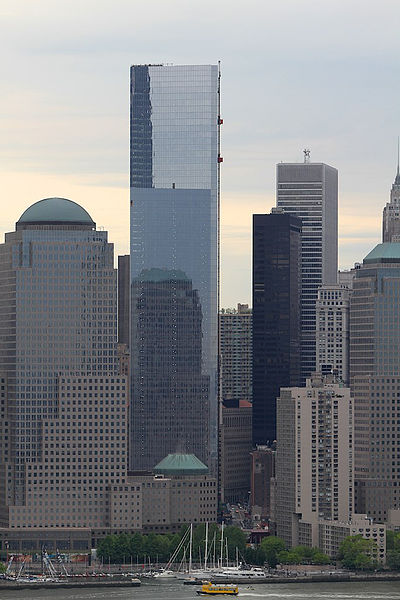 Construction at 4 World Trade Center, the GM building on Fifth Avenue and 59th Street, and the Time Warner building at Columbus Circle could be halted if the strike continues. The woodworkers association’s request for a 10-year deal and wage freeze prompted the strike, the union said. On average, members covered by the MWA contract at issue make approximately $31 per hour with benefits. Certain construction projects at 4 World Trade Center, the General Motors building on Fifth Avenue and 59th Street and the Time Warner building at Columbus Circle are threatened by the strike, the union said. A number of elected officials have reached out to the striking workers to show support, according to Kwame Abasi Patterson, a spokesman for the New York City District Council. The District Council and the MWA, which employs union members from various District Council locals, have been involved in contract negotiations for more than a year. The District Council says it has made a number of concessions to the association but claims the MWA demands are still too far-reaching. MWA wants a wage freeze across the board, a second-tier employee system with lower wages and benefits, and a 10-year agreement, the union said. “Nobody wants a strike, especially during the celebration of our country’s independence, but if we concede any further, it would be detrimental to all of our members and their families,” said Stephen McInnis, president of the New York City District Council of Carpenters. The woodworkers picketed member employers of the Manufacturing Woodworkers Association of Greater New York. The union says the association wants a 10-year agreement and a wage freeze. McInnis told the New York Daily News that the union had agreed to a 10-year deal with wage negotiations possible, but couldn’t agree on benefits. McInnis said it was not fair to retroactively change the benefits structure for workers already on the job for 15, 20 or 30 years, but noted that the union is open to making changes for new hires, according to the news bureau. The contractors association, however, believes the union left the negotiation table too early. The current contract expired June 30. “They called a strike immediately when the contract expired,” Catherine Condon, an advocate for the association, told Crain’s New York. Both sides maintain that settling a contract and ending the strike is crucial, but “neither appears willing to make the next concession,” according to Crain’s. The New York City and Vicinity District Council of Carpenters is one of the largest trade unions in the construction industry, with 20,000 members in eight locals. The District Council said it has started a strike fund and an assistance hotline to help its members who are now out of work. With more than 20,000 members in eight locals, the New York City and Vicinity District Council of Carpenters is one of the largest trade unions in the construction industry. The MWA consists of the following member employers: Bauerschmidt & Sons; Eastern Millwork; Midhattan Woodworking Corp.; Tatco; Craftsman Woodwork; Ignelzi Interiors; Nordic Interiors; Tobin Woodworking; Dimaio Woodwork; Island Architectural; Rimi Woodcraft and William Sommerville.